Fluted point from Franklin Co., Vermont----Ramah chert. 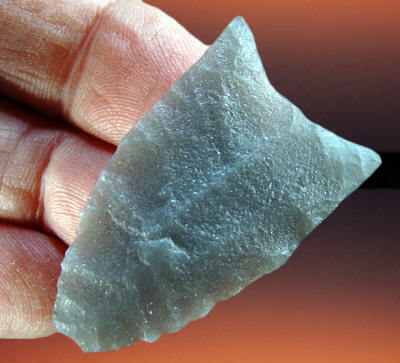 This fluted point was surface collected many years ago by a farmer on a site that is believed to be somewhere in Franklin County, in southwestern Vermont. It was previously reported by Stephen Loring in an article called "Paleo-Indian Hunters And The Champlain Sea: A Presumed Association." This point is most important for the material it was made from. 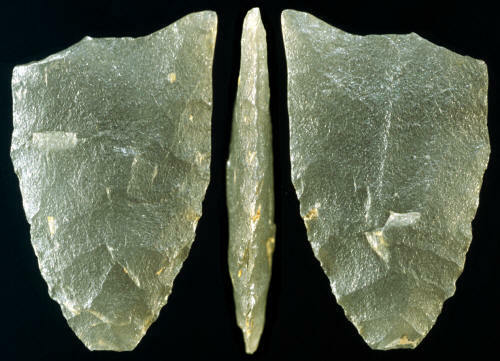 Stephen Loring (Smithsonian) originally identified the material as Cheshire quartzite, which is a material that is found in north central Vermont. But in his more recent analysis of the point he was able to identify the material as Ramah chert from Labrador. The analysis was done with the use of lab equipment such as laser spectrograph or x-ray diffraction. This would mean that the source is considerably further away than first thought. In fact, this distance rivals many Early Paleo transports. 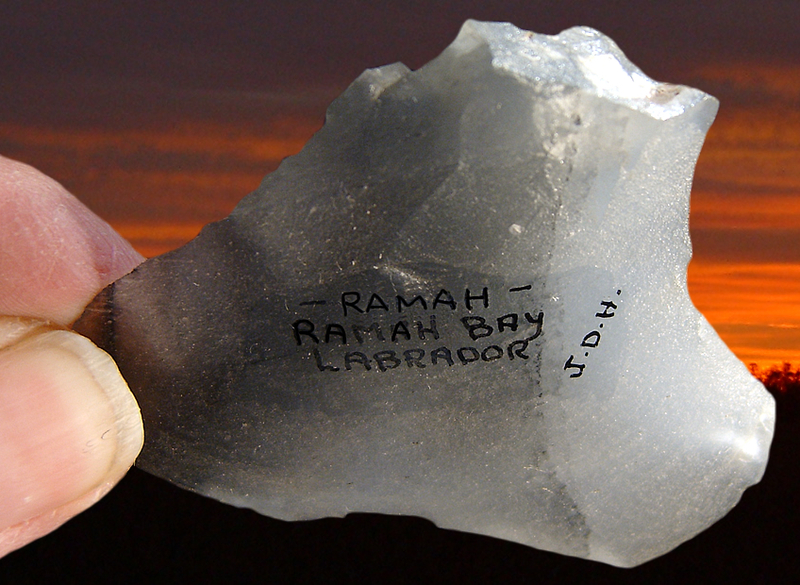 A straight line from the find area to the known Ramah quarry along the Labrador coastline at Ramah Bay measures approximately 1,100 miles but a more probable circuitous route might be closer to 1,600 miles. It's believed that this point is fairly early and dates to at least 10,000 years ago or more. This point is fluted on both sides and was evidently discarded after it was last damaged from impact. The tip of one ear was broken off and there is some impact damage on the tip of the point. The ear was restored to return the point to its original symmetry. This point measures 1 1/2 inches (3.8 cm) long. This picture shows three views of the original fluted point before the one ear was restored.